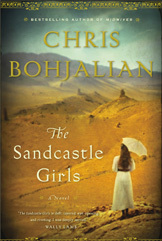 The Sandcastle Girls is Chris Bohjalian’s 15th book, and was released on July 17, 2012. This is a fictional account of two women who are related by their Armenian ancestry – one from the early 1900s and one from 2012 – and whose fictional lives intersect in the true story of the Armenian genocide of the early 1900s. It is a personal story for Bohjalian who is of Armenian ancestry himself. It was personal to me, too, as I lived in an Armenian community in Boston in the 1980s and talked about this very topic in my post about an Armenian woman, Gram, Three women who helped shape my world view. The Armenian genocide, considered by many to be the first modern genocide, preceded The Holocaust. It occurred from 1915 to 1923 at the hands of the Turkish Ottomans (longer date ranges are also recognized) and resulted in the deaths of from 600,000 to 1,800,000 Armenians through deportation and mass murder. The primary reason behind the desire to annihilate an entire ethnic group revolved around religion. The Turks were a Muslim majority, and the Armenians were a Christian minority. To this day, Turkey does not recognize that a genocide even occurred. The fact is that Armenian men were routinely rounded up and murdered. Women and children and the elderly were also rounded up. Some would die by being sent out on boats into the Black Sea to drown. Others were marched hundreds of miles into the Syrian desert. Many were raped and tortured along the way. Most of those who survived the marches were left to die of starvation and disease in camps in the desert. While many of us are unaware of this particular tragedy, it was pretty widely known when it was occurring. Because of the political issues surrounding WWI, many countries chose to be uninvolved in the crisis so as not to upset the balance of power during the war. Bohjalian tells the story of Elizabeth Endicott, a wealthy American woman, who travels to Syria with her father to help the Armenian refugees. She meets a young Armenian engineer who, quite surprisingly, has managed to survive being killed unlike most men his age. We learn of their story from their granddaughter, Laura Petrosian, who discovers their history in a series of letters and journals and photographs that also survived destruction. The story weaves back and forth between the two women until it comes to a bittersweet conclusion with the revelation of a secret. While this is a fictional account, much of what is shared about the actual Armenian genocide is familiar to me from the stories I heard from the Armenian families with whom I lived in Boston in the 1980s. I also enjoyed reading about the foods and culture that exist in the Armenian communities today – many of which I experienced first hand. Unfortunately, we don’t seem to be able to learn from the mistakes of the past. People, who are in the minority, continue to be discriminated against by people in the majority. People, who are of different religions, continue to war with one another. People of different ethnic or racial backgrounds, cannot seem to get along. I strongly recommend this book, and I hope that by writing this fictional story, Bohjalian provides some measure of comfort to the actual, real life survivors of this tragedy. I hope, too that it can be a lesson to us all about human rights and dignity.